Oven...which I don't plan on ever using anyway, but I need to try it while the manufacturer cares about me. So, that leaves the water heater. I was very busy today redoing the TV brakes and basically the whole right half of the front axle, but at one point my Grandpa moved to the left side to see if it needed new parts as well. While he played around with that, I left and decided to try the WH. So I got the hose hooked up, turned on the water, forgot it was winterized and the low points were left open at the factory, turned the low points, rinsed out the water heater, plugged the water heater, opened each faucet to get water through each, and then I went to push the button on the water heater. I did, and it wouldn't light. I tried about five or six (maybe more) times and it still wouldn't light. I did everything else on the list above yesterday, so I know there was gas to the line, especially since it's in the front right corner of the coach. I first decided to take the main gas line off as is comes into the heater. Gas comes out. I reconnected it and then proceeded to take apart the burner tube assy to see what spider(s) has decided this water heater is a good home. After taking like four or five screws out (this is a lot more complex than a gas only model), the burner tube still wouldn't come out, but I never did feel or hear any gas coming out of the small hole outside the valve. By this time my Grandpa had determined the previous owner did the whole left side of the axle already, so he put it back together and was ready to go to the dealer to get parts. I put the WH back together and left it. Later on, my Dad got home and decided to play around with that. I told him to write down everything he did so I could post it here. He took the time to determine the electric mode does work...I guess this was after I told my Mom the stove works great and she's more than welcome to heat water on the stove...not to mention she's got a nice new rocket burner/turkey fryer she can heat water in. After all, this is supposed to be camping! Anyway, I could tell that didn't go over too well and this test was completed ASAP. So at least we can have hot water for the weekend, but just at a slow rate, if it can't be fixed in the mean time. - Removed two amp fuse on WH itself, it's OK, but cleaned the tips off while I was at it. - Double checked inside converter. - His best guess: circuit board that controls spark and sensor electrode is bad. It is an Atwood model GC6AA-10E. My switches look like this. The only difference is I have a gray 1 and gray 2. When I turn it on gas, after about 2-3 minutes, the little light in between the WH buttons comes on and stays on, while the gas switch is lit up the whole time. Anyone have any suggestions??? We do hope to leave in T-58.5 hours or less. The first thing I would do is remove and reinsert those two wiring harness connectors at the top of the board about a dozen times to remove any oxidation from the pins and the sockets. You're obviously getting 12V to the board through the wall switch because the fault light illuminates after a few minutes. 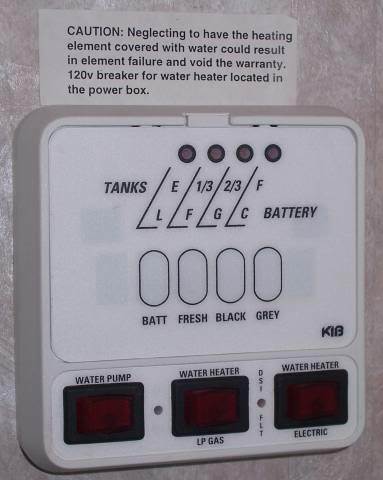 Stand near the water heater and have someone flip the gas switch on for you. First, you should hear a thunk sound, which is the gas valve opening. Then you should hear the rapid click-click-click of the ignitor. I'm thinking you know this already If you have a real quiet gas valve, you should be able to feel the "thunk" by placing you hand on of valve. Anyway, if you hear both sounds and it's not lighting, then the board sounds OK and I would look for an obstruction in the burner element. The hole in the orifice is pretty small and it sure wouldn't take much to clog it up solid. I had mine out for cleaning a few weeks ago, and IIRC it was 3 or 4 1/4" headed screws to get the burner tube detached. If no thunk, but the ignitor clicks, I'd probe the wires feeding the gas valve checking for voltage. If it's getting the power, suspect the gas valve. If no power, suspect the board, cut out switch or a bad connection - just trace it back with the meter. According to the wiring diagram, the ECO is in line with the gas valve. You said you already tried bypassing it, but mentioning it for completeness.. If you hear the clunk but no ignitor clicking, TURN IT OFF, and check the connection on the high voltage wire for the ignitor. Thats the fat red one with the rubber boot that runs from the board to the burner. You should be able to carefully slide the boot back where you will find IIRC a 1/4" spade connector. Remove/reinsert a few times to clean it up and slide the boot back. If no sounds at all, and those connections on the harnesses are clean, then I'd be inclined to agree with your Dad on the board being bad. All connections are now clean, and still nothing. I've never heard any clicking, which worried me, but couldn't hear a thunk either. Yep, sounds like the board is toast, Jon. I'm not sure what your warranty status is (if any) on that.. If it's out of warranty and you guys don't get a new board before you head to Buttonwood, I'll gladly pull mine out and let you swap it in to see if it solves the problem. I'm assuming the board is the same, but it would be easy enough to check. We'll be in Thursday afternoon, feel free to stop over. Is there any chance the gas valve on the burner is turned off ? Even with the valve off I think you would still hear the igniter clicking. OK we are gonna get you thru this, BUT a few things to confirm first and then check. I can tell Frank has been thru this before. I can hear the noises right from his post… .and he provided us the wiring diagram so I can read it. You said it worked on electric but no gas? YES/No? Now assuming electric does work. Like Frank said, when you turn on the GAS rocker switch, the first thing you hear is the “thunk” of the gas valve then the “click” “click” “click” of the ignighter. If neither of these are working, stop. Do not tear apart the gas lines or gas valve orifice. If you have no clicks or thunks it will not matter about the gas and you could mess up the gas trying to get it to work. If we have clicks and thunks and no work, then tear into the gas. OK Frank pointed you to the clicks and thunks and you say you have neither. If you can confrim this by standing next to it. BUT we do not know if the module control is actually receiving a full 12 volts to tell it to activate the gas system. Now IF you have 12 volts on the orange wire and no click click click we have to make sure that the safety circuit did not get messed up with all the fiddling. Have to make sure the T stat and the thermo cut out are working, still. Do a continuity check between Brown 1 and Brown 3. Make sure the gas switch in side is OFF or even better pull the white plug on the board and just do an ohm check on the 2 brown wires. If you have continuity, then the safety is working. Plug white connector back in. IF you have clicks then we know the igniter is working. No clicks and you confirmed that 12 volts is on the orange wire and you have continuity on the brown safety, and you are sure terminals are OK, then the board is truly suspect OR you have a ground problem. Make sure Green 5 and green 6 are tied to DC ground. If you have clicks and no thunk, then the ECO is suspect, the gas valve or the board. A voltage check will confirm which one is not working starting at the board on RED 4 on the board which you said was 9 volts. That is maybe an issue. Should possibly be higher. Ground may be an issue. 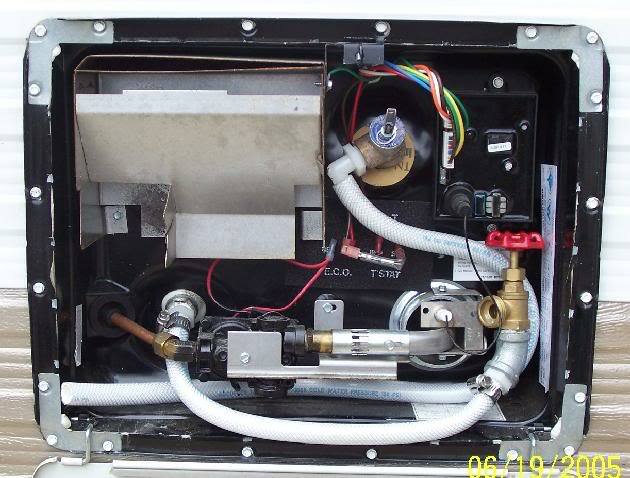 While you have no clicks due to igniter, the gas valve should still go. But 9 volts may not be enough to pull in the coil on the valve and may not be enough to make the igniter work either. Check the voltage between Orange 1 with gas switch on and green 5 and green 6. This should be 12 volts, if it is 9, h’mm again check the ground. BUT, if electric hot water works, well then just run on electric until you can get a board. We do all the time. 20 minutes and the water is hot. Also once you get that little red light inside as a fault, turn off both the electric HW switch and the GAS HW switch. Both must be off to reset the safety or nothing outsdie will work. We assume you did this. Let us know. If you get to the CG, Frank and I can both help. - Remove both red leads to expose the one sensor. Checked for continuity...it beeped, OK.
- Removed both brown leads to expose the other sensor. Also checked for continuity...it beeped, also good. So that eliminated a problem with those. That's why he decided to take the board and have it checked tomorrow. Unfortunately, all the General stores, I am told, don't have any. Another dealer in SE MI does, and Stoltzfus does have two. In fact, the person at Stoltzfus was really helpful and told me I could run it through Atwood under warranty. After all, I've only had it for four weeks to the day, so it should still be under warranty! The other dealer around here said it's a pain to deal with Atwood, so they wouldn't do anything with a warranty. BTW, the WH did seem to be outputing warm water after about 15 minutes of being on in electric mode. While you have it off, check the voltage between orange (+) and both green (-). It should be a good 12.6 or so volts. Actually like 13.25 or 13.6 while on the convertor and shore power. You could be suffering from low voltage or a weak ground. The board is at least 1/2 working if you have electric and the gas fault LED on inside.